Bobbie Griffith was, I think, my second cousin twice removed, or something like that. 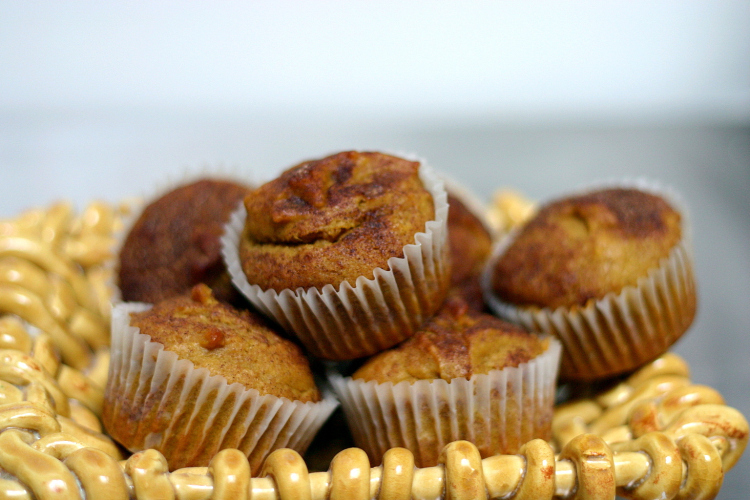 Anyway, she lived in Wisconsin and this is her recipe for pumpkin muffins. They’re spicy and comforting, and easy. Preheat the oven to 180. Butter a 12-cup muffin tin, or line with paper muffin cases. Cream the sugar, treacle and butter together until very light and fluffy. If you use an electric mixer you can leave it to do its work for as long as five minutes if you like. Add the eggs and pumpkin and blend well. Combine the flour, oat bran (if using), bicarbonate of soda, salt and spices and mix well. Add the dry ingredients to the pumpkin batter and mix only until blended—don’t overbeat. Spoon the batter into the muffin tins and bake for 20 to 25 minutes or until a toothpick comes out dry when inserted into the centre of a muffin. Let cool a little before eating. Slice your pumpkin into large wedges and remove the seeds. Place it on a baking sheet and roast until it’s cooked and tender throughout. Depending on the size of the wedges this should take between 15-30 minutes. Peel the squash and mash or purée with a hand blender until smooth. You can freeze any extra.